As a seminarian, I know the struggle of not having enough time or money. I currently have no regular income – other than student loans – and enough work to do that I could keep several clones of myself busy for years to come. Concerns about paying for things and doing all the things I’m supposed to do are real, but I don’t have the stress about them the way I once did. Some of this has changed as I have not only gotten a little bit older but more mature and better at deciding what is actually important and what can wait – or, more accurately, what is likely to be lost in the ether forever. Some of this has been the direct result of being involved in timebanking. I joined our local timebank in Kent, Ohio in late 2010 and quickly became involved in the management and administration of it. Timebanking is a way – a system of exchange – for people and groups (including organizations and businesses) to connect and to share their time, talents, and resources with each other, with the goal of building supportive networks and strong communities. The basic idea of timebanking is that all time is equal – my 30 minutes is the same as your 30 minutes, no matter what we’re doing in those 30 minutes. 30 minutes is 30 minutes. Each of us has the same 24 hours to use every day, regardless of how they are spent. Dr. Edgar Cahn, the creator of timebanking, says that, “We have what we need if we use what we have.” The ‘we,’ of course, is larger than any household or family – it extends to neighborhoods and whole communities and farther. The point of what he’s saying is that, together, we can always do more than we can alone. As neighbors and those in community, sharing, cooperating, and collaborating – sharing what we have, what we know, what we love, what we dream – we can find the resources and skills and time to make it all possible. All people have value. As Unitarian Universalists, we often speak of our commitment to ‘the inherent worth and dignity of all people,’ but this conflicts with our consumeristic, competitive American culture, which tells us over and over and in all ways that, ‘time is money’ and that we have to be at least efficient, if not super efficient and keep doing All The Things, without reflecting on the personal cost. Life is not a race or contest to see who gets to the end first or fastest or most efficiently, and whoever has the most at the end doesn’t win. Many are seen having less or no value in society because of our ‘time is money’ frame – those who are marginalized, the underserved and under-engaged – elders, children, the disabled, those who cannot work, those with limited resources, those with less education, those in poverty, those who are experiencing homelessness, and so on. Resources may be allocated, often with stipulations and capped at low levels, but these resources may also be taken away. ‘Time is money’ doesn’t serve the people who need – and depend on – these resources because of our value in money over time. If you have been in relationship with people who may be considered ‘resource intensive,’ you know that they still have plenty to offer, but things that are often not valued by society in general – because they take too long, because they aren’t linear, because they are ‘soft’ resources. Timebanking was the first time I got to see people re-imagining what a community can look like – not just dreaming but living into the dream and the belief that all people have value. 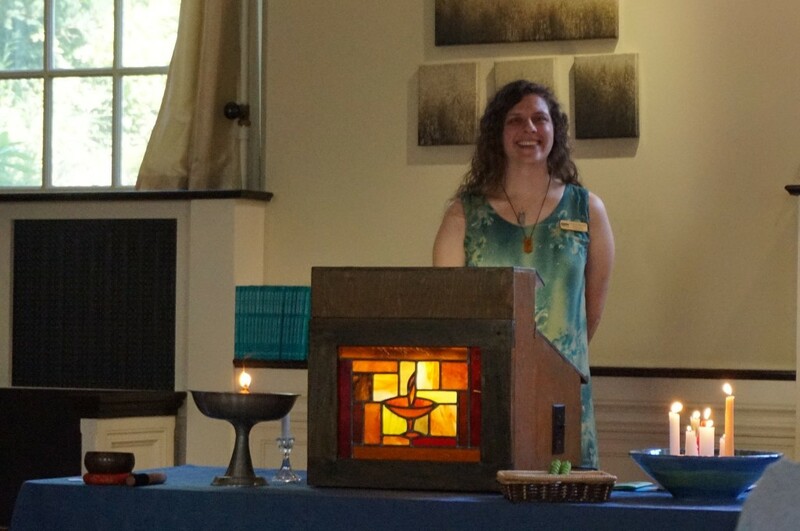 Abby Greer, who is the Executive Director and Founder of the Crooked River Alliance of TimeBanks, understands timebanking not only as a way to rebuild community, but as a way to re-connect people with their passions. When people are doing the things they love, it doesn’t feel like work – it feels like joy. We hear regularly in the timebank of people who have been so excited to do something they love, sharing it with others, that they can’t remember if they were supposed to be giving or receiving – because in giving, they received something. They are filled with a joy that makes their hearts sing, and when that happens, it changes how you think about time and money and everything our popular culture and Puritan work ethic tell us that we ‘should be’ – you learn that another way is not only possible but that it can be. There are theological implications to this way of thinking. We don’t talk about sin much in Unitarian Universalism, but I mention it here because one of the ways that I understand sin is as when we turn our backs on each other, when we willfully, intentionally deprive each other of relationship, of time and energy and care. In this way, greed is a form of sin – valuing money and ‘the bottom’ line over people. Salvation – redemption – then, is turning to each other, giving ourselves to each other, committing and covenanting to our need to be in relationship with one another. Time is not money – time is time and it is our most precious, and therefore most valuable, resource. My purpose in sharing my experiences with timebanking today are not necessarily to encourage you all to be involved in a timebank or similar organization, but to share with you how my own understanding and appreciation of time has re-shaped how I engage and interact with others and the wider world. Returning to the idea that time is money – maybe we need to start thinking about this in a different way, and maybe time really is money. Or is money time? My appreciation for time went to a new level when we opened an exchange center in the timebank – a place where people could exchange goods – non-perishable foods, excess produce, housewares, clothing and accessories, pet care items, and all sorts of treasures, which could be exchanged for time. People would come in to the center and ask how much items were worth. The questions we then asked them to consider were – “How long would you be willing to work to get that item? How much of your time is that worth to you?” Talk about needing to shift your thinking! It’s a challenging concept for people to get the hang of, although often, the more you do it, the more familiar it becomes, until eventually, that is how you think about things. Now when I go to any store, I find myself doing conversions in my mind of how much time I’d spend to acquire different items. And when I catch myself doing this, I am reminded that my time has great value, and that, at least for today, I have an abundance of time. Going back to Edgar Cahn’s quote – “We have what we need if we use what we have,” it’s a reminder that we often have unused or underutilized resources – our own and those of others. The idea – and importance – of sharing in communities goes back for thousands and thousands of years, across cultures. Timebanking isn’t exactly a new idea – people used to barter and trade for all sorts of things through the millennia. But, when we got highways and air conditioning and most adults working and the demand for consumer goods skyrocketed in the economic boom after the Second World War, we forgot how these networks were an integral part of sustaining individuals, families, and communities. We began to value things over people, money over relationship, independence over interdependence. I don’t think we’re better off for this – I think that this is a primary source of the pain in our communities. It is in our disconnection from each other that we begin to think that some have more value than others. We need each other – and not in a casual way, we need each other in a vital, deeply life-giving-and-receiving kind of way. As individuals, we are in deficit, never having all that we want and need. As community, we can be in abundance, always having all that we want and need.